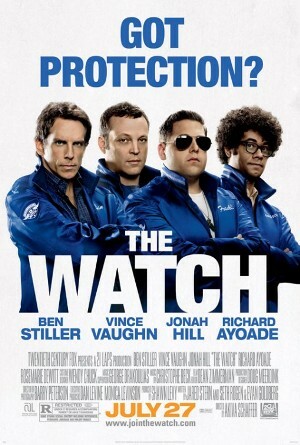 The Watch has a few things working in its favor: Vince Vaughn, Ben Stiller, and a quirky script. It’s also fighting a few factors that are working against it. For those that don’t know, the release of this film was shelved for a few months after the George Zimmerman shooting of Trayvon Martin. Let’s just say it was a smart move. While this film wasn’t quite a replay of the exact incident, it had striking similarities in that it was based on some overzealous neighborhood watch guys patrolling the town looking for trouble. I’m not getting into the tragedy of the real-life shooting, but the reason I bring it up is because if this was a pure comedy, I don’t think it would have received such strong opposition to its release. The problem is that the film didn’t have a true identity, which made it easier to be viewed in bad taste. If you ask me what this film is and how to explain it, I would have no idea how to answer. Is it a comedy? Kind of. Sci-Fi? Sure. Mystery/thriller? What the hell…why not. For all of its ambiguities, it takes you in a number of different directions as a viewer. It doesn’t always make sense but hey, at least it’s a bit different than the rest of the cookie cutter scripts being made into features these days. Don’t be surprised though when you’re left scratching your head trying to follow all the ancillary story lines that really could have been carved out without losing anything in terms of the story. I hope this isn’t a spoiler for you…but this film is about aliens. The trailers did a nice job of concealing that fact but I had read about it beforehand so I knew what to expect. But for those who didn’t know…you’re welcome. I just saved you from sitting in the theater for the first 45 minutes wondering what the hell was going on and letting out an audible “What the F-“ when you finally see some slimy looking freak come on the screen. I see shades of Ben Stiller’s character from The Heartbreak Kid, Vince Vaughn in Couple’s Retreat, and Jonah Hill in, well, everything he’s ever been in. I don’t really think the parts come together well enough to make this film successful, but each character has a few high points and generates a couple of decent laughs. The rest of the time you’re stuck watching a product placement showcase and deciphering between when the film wants to be funny and when it’s attempting to be serious. The identity crisis really holds us back from enjoying it more. Interesting Cameo Appearance: R. Lee Ermey (aka Gunnery Sgt. Hartman from the all-time classic film Full Metal Jacket) as Manfred, a character that is basically what the Gunnery Sarge would’ve been like in his graying age and these modern days (living in the woods toting a shotgun and screaming at maggots to get off his property). Evan: Wait a second I’ve seen this stuff before. Franklin: Had you just won a Nickelodeon Kid’s choice award? Franklin: I don’t touch your butterflies! Franklin: Look at him and understand me. Look at both of us but understand no one. Listen to my words and hear his face!